Each element contains a different number of electrons, protons, and neutrons. Example: Hydrogen has one electron, one proton, and no neutrons; oxygen has eight electrons, eight protons, and eight neutrons. An isotope forms when an element has the same number of protons, but a varying number of neutrons. Thus, the elements all have the same chemical properties but differing atomic masses. An example of this would be Oxygen. Oxygen has four isotopes: O-15, O-16, O-17, and O-18. Some isotopes are stable (like O-16, O-17, and O-18), while others are not. Those that are not will decay into a new and hopefully more stable isotope. Oxygen 15 is unstable, and has a half-life of 122.2 seconds. Blink and you'll miss it! Elements all want the same thing out of life: to be electrically neutral, and to have eight electrons in their outermost (valence) shells. Let's look at oxygen. 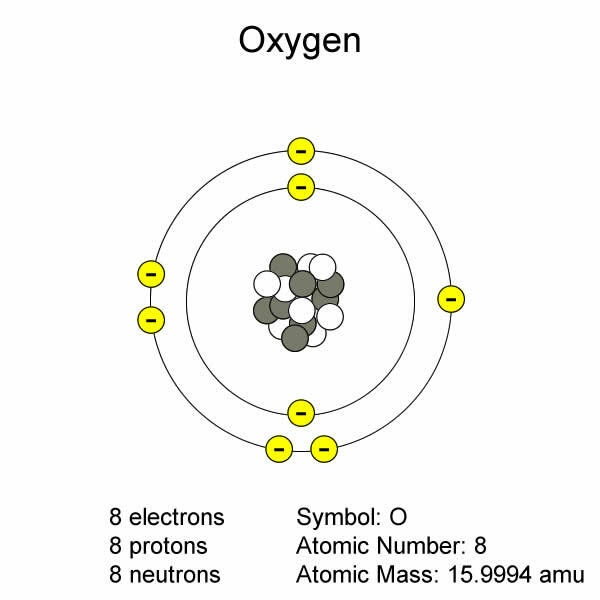 Oxygen has eight electrons, but only six in the outermost shell. This creates a negative 2 charge. So oxygen has a charge (-2) and does not have eight electrons in it's valence shell. Elements such as oxygen bond together with other elements to create molecules in an effort to satisfy these two needs. Metallic - Valence electrons are free to migrate among atoms. This type of bonding is weaker and less common. Van der Waals - Attraction between electrically neutral molecules with asymmetrical charge.